Scalp products are trending in the hair-care industry, and celebrity stylist Kristin Ess recently released the Scalp Collection at Target: a range of five products that tackle dandruff, itchiness, buildup, and dryness. The line's $12 Scalp Purifying Micellar Shampoo is the only thing I've used that's been able to handle my chronic dandruff - including Head & Shoulders and Neutrogena T Gel. The shampoo uses micellar technology to grab flakes, product residue, and bacteria like a sponge. When the shampoo is rinsed, all that buildup is gently carried away. This makes it a more moisturizing option than traditional dandruff shampoos - which could be why it works so well to soothe flaky scalps. I'd say that chronic dandruff is my secret shame, but it's really not a secret at all. Anyone who lays eyes on my nearly jet black roots is sure to spy a few flakes. Ok, more than a few flakes. A lot of flakes. My husband affectionately calls me "Flakey." It's kind of my thing. That's not to say that I haven't tried - desperately - to get rid of the ever-present dandruff. I've experimented with everything from classic Head & Shoulders to Neutrogena's medical-strength T Gel, which is filled with coal tar, an ingredient that couldn't sound less appealing. I even went so far as to completely overhaul my diet by eliminating sugar and wheat, which actually did help. But give up pizza indefinitely over a few pesky little flakes? No chance. Luckily, my peak flakiness coincided with the hair industry's obsession with scalp care. 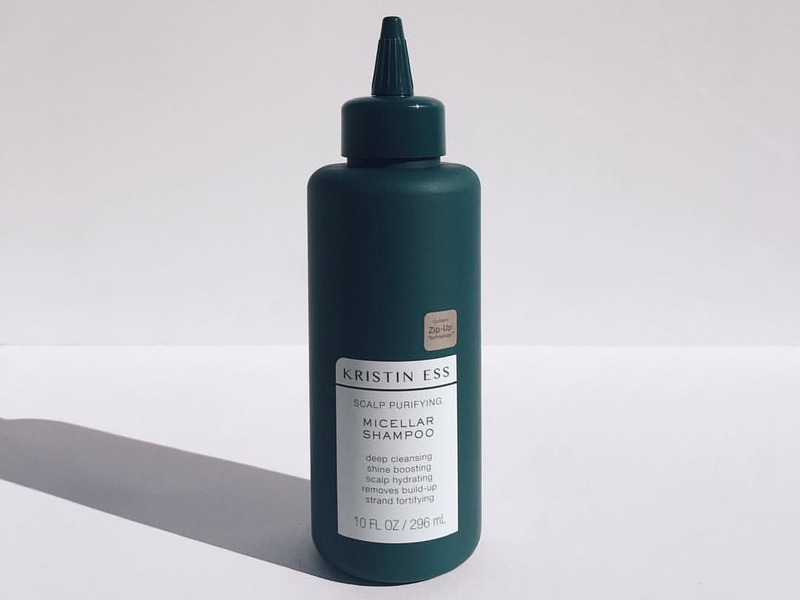 Over the past few months, the market's seen an influx of scalp-focused hair-care products; most notably, the Scalp Collection from celebrity hairstylist Kristin Ess. The range features five options, from an oil to a bubble mask, that all promise to purify, hydrate, and detox the area - and considering that each item is under $15 and available at Target, I obviously had to try them all. The Instant Exfoliating Scalp Scrub, made with hydrating sugar instead of moisture-sucking salt, and the Detoxifying Bubble Hair Mask, which tingles and pops like a packet of Pop Rockets as it cools the scalp, are definitely standouts; but the product that's made my can't-live-without list? The Scalp Purifying Micellar Shampoo. "Micelles, if you can imagine, are tiny molecules that are designed to pick up dirt, oil, and buildup like a sponge," Kristin Ess, the founder of her eponymous hair-care line and go-to stylist to stars like Lauren Conrad and Lucy Hale, tells Business Insider. "Then when you rinse the shampoo, that little sponge carries those things away." Ess explains that her micellar shampoo utilizes a completely different technology than traditional shampoos, which usually strip the scalp and strands of natural oils and "repel" future buildup. In dandruff-specific hair products, this stripping function is amplified in an effort to remove tough flakes from the scalp - and if you're already prone to dryness, this can make the area even more dry and peel-y. Instead of harsh stripping, the Scalp Purifying Micellar Shampoo gently lifts buildup and leaves behind a layer of much-needed moisture, thanks to the natural mango seed butter, avocado oil, and castor oil inside. I'm convinced that's what's made such a difference in my dandruff levels - because, yes, my scalp is now flake-free for the first time since I can remember. "I also find shampooing with micelles to be less work, if we're being honest," Ess says. It's true: A little bit goes a long way. Add water to the silky-slippery formula and it instantly suds up into a thick, rich lather. The bottle even features a genius pointed-tip applicator, which makes it easy to part hair into sections and deposit shampoo right onto the scalp. This is particularly helpful for those of us with thick or curly hair. It's worth noting that you don't need to be struggling with dandruff to love this shampoo: It also makes hair super shiny (thanks to those aforementioned natural oils) and protects hair from pollution damage with Kristin Ess' proprietary Zip-Up Technology. Essentially, this tech "zips up" split ends and smooths out the hair cuticle. The result? A glossy, frizz-free, flake-free head of hair - no matter what your natural hair type is. "You can use this on the finest, thinnest hair or the thickest, curliest hair and get the same perfect results," Ess says. That being said, each product in Ess' new range does have a specific function to solve any scalp issue, from itchiness to dryness. "For example, I recommend starting with the Anytime Anywhere Scalp + Hair Milk Oil if you have an itchy scalp and you need something soothing," the stylist says; while the Scalp Detoxifying Bubble Mask and the Instant Exfoliating Scalp Scrub tackle thick, flaky buildup. "The Weightless Hydration Daily Scalp + Hair Mask is good for moisturizing the scalp in general on an as-needed basis, since it can be applied directly to the scalp unlike most conditioners," she adds, making it a must-have for healthy, hydrated hair. And, of course, the Scalp Purifying Micellar Shampoo deserves a spot in literally everybody's hair-care lineup. Ess recommends rotating it with a more clarifying formula, like her The One Signature Shampoo. "I hear so much about people's ongoing struggle with scalp issues and I just wanted to see if I could help," Ess reveals of the motivation behind the line. "Scalp care has always been either unappealing or a full-on chore and that's why we avoid it - I decided to make scalp care fun." And being able to flirtatiously flip my hair in my husband's general direction without being called "Flakey" is definitely fun.